Thirty years is just the beginning! 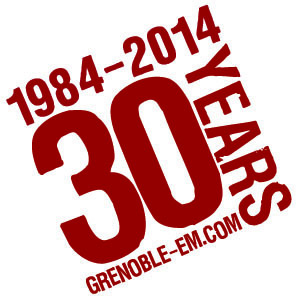 Celebrating 30 years of growth and innovation, Grenoble Ecole de Management (GEM) continues to work towards the School of the Future. In striving to bring alumni new opportunities, "we are moving beyond traditional teaching methods, past differentiated instruction, towards a third method focused on interconnectivity," explains our Dean Loïck Roche. Our continued search for the teaching methods of tomorrow is the key to connecting GEM's students to the future of learning. A strategy to impact and inspire partners not only at home but around the world. An international expansion geared towards spreading GEM's international renown and opening new doors for our alumni. Today, a 30 year anniversary marked by ties to universities such as Beihang, Pace, Simon Fraser, and Georgia Tech. Tomorrow, return to GEM in Korea, India, Japan or Taiwan! Join us on May 22nd and 23rd to celebrate your School of the Future's 30 year anniversary. Look for your invitation to participate in the numerous festivities, conferences and debates in our next Newsflash.